Despite checking the anchor every 3 hours to ensure it was dug in, we got a really good night’s sleep. 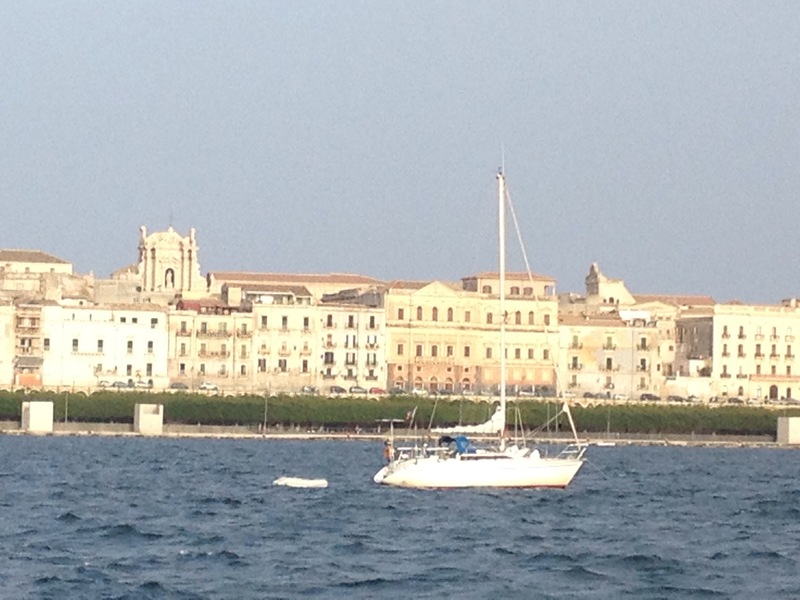 We awoke to a calm anchorage in front of the pretty town of Ortigia with about 24 other boats. After breakfast and a lovely chat with one of our neighbours, we motored the dinghy into town. We moored baby Nimmie with the other dinghies in the channel between the old and new towns. 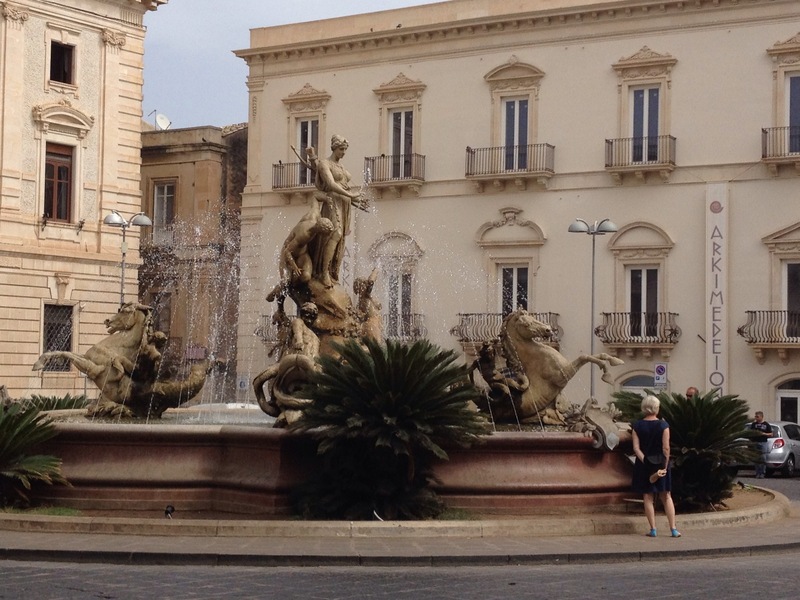 Siracusa, per se, has nothing much to commend it but the ancient town of Ortigia is magnificent. There is a lovely mix of Greek, Roman, Byzantine and medieval architecture with cobbled streets and stunning buildings. 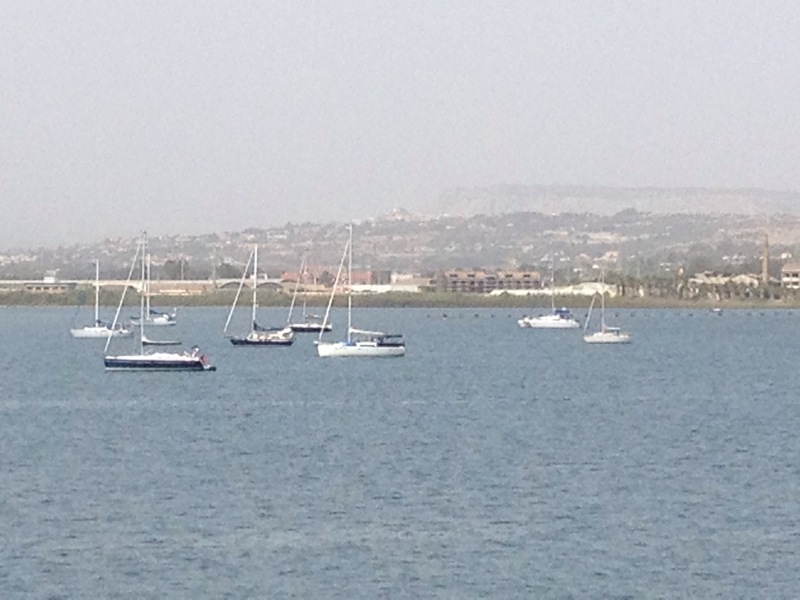 Archimedes was born here in 287BC and Nelson anchored here before the Battle of the Nile. The old town has a fabulous street market selling fresh, local produce. 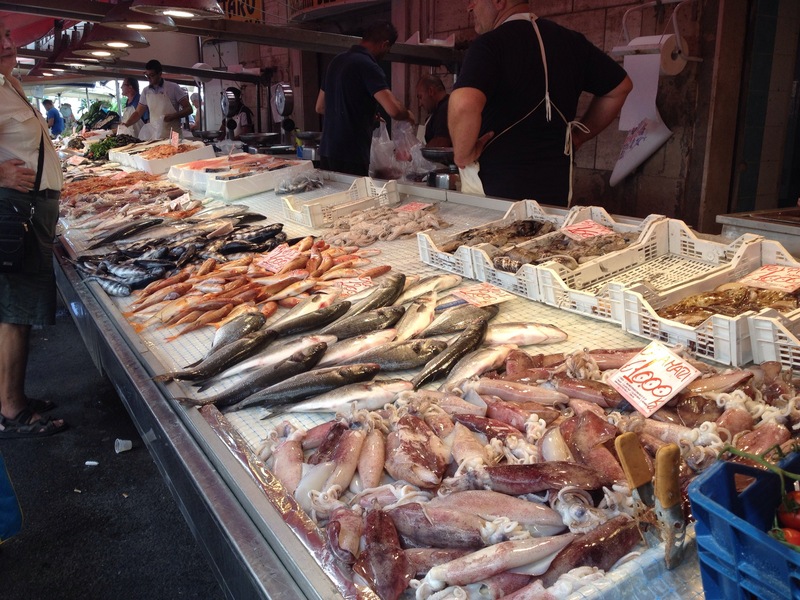 We bought bread, cheese and fruit as well as some squid to make calamari with for lunch and tuna for our supper. We then had the requisite gelato whilst we ambled through the streets. We decided to stay put today and explore the area more but when we returned to the boat the afternoon sea breeze blew up early so decided not to visit the Greek theatre on the west of town as we wanted to make sure we were safely anchored. Instead, Jo had a fairly lazy afternoon and Liz decided to repair various things as it was a very pleasant temperature. We may go into town later for a drink if things calm down. Whilst the anchor is well set, we will now get soaked in the dinghy because of the breaking waves – not a good look when walking into a bar! Despite wind speeds of 20 plus knots, it is still 30 degrees and feels lovely. As the evening progresses, the wind is still 12-15 knots so the sea hasn’t calmed enough to warrant a trip into town. As we were preparing dinner, a super yacht decided to weave its way through the anchorage in the dark. He narrowly missed a number of boats and came very close to us! Luckily we have lights on and he changed course. I think he was trying to find the marina – hasn’t he heard of a chart plotter and GPS?! 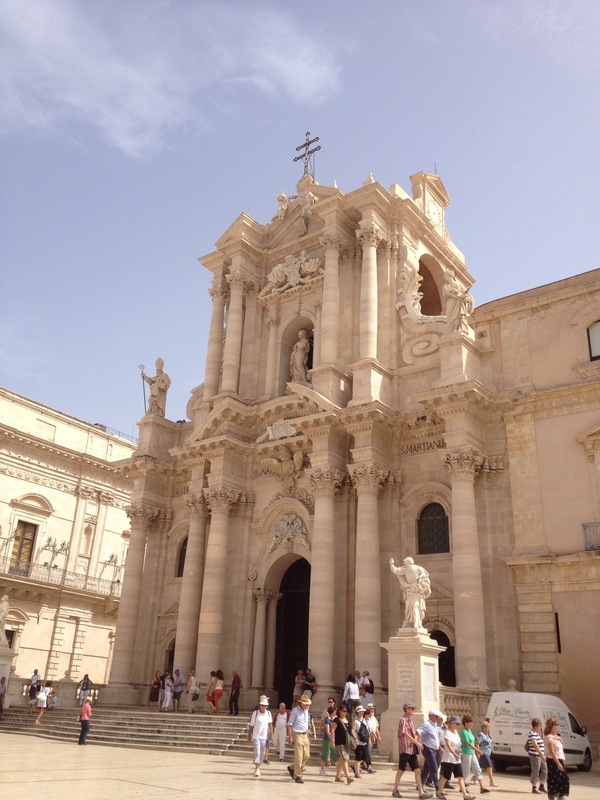 Tomorrow we are planning (don’t laugh) to go down to the tip of Sicily to Portopalo before sailing overnight to Malta. Pictures below of the market, various buildings and monuments in the old town and Nimmie at anchor (right at the back!). 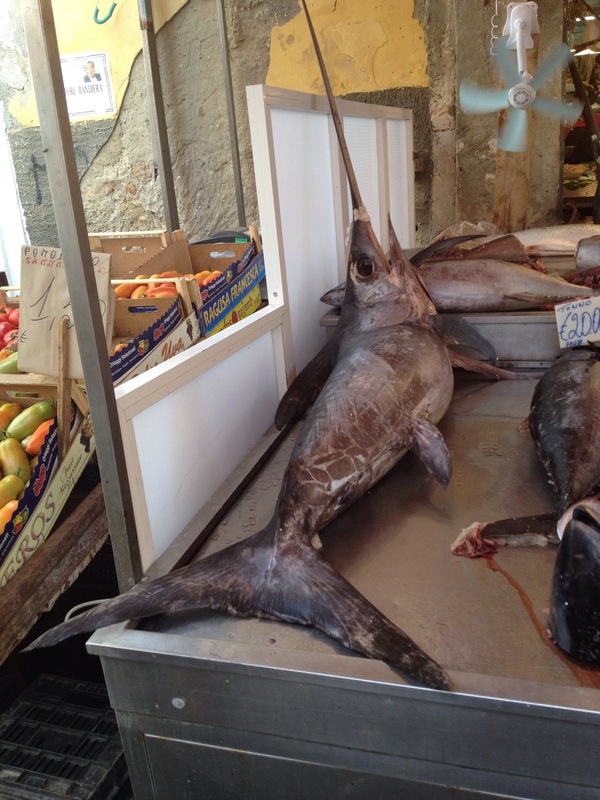 This entry was posted in News and tagged 2014, Italy, Med, Sicily. Bookmark the permalink.